My first official Halloween design of the year! I can't believe it took me so long to do one. I have so many ideas in my head but then they never turn out quite like I imagined them when I actually try them on my nails... But, happily, this one came out perfect! This one is a Bundlemonster stamp (both images are from the same plate) in Sally Hansen Chrome Nail Makeup in Black Pearl Chrome over NYC Blackula. 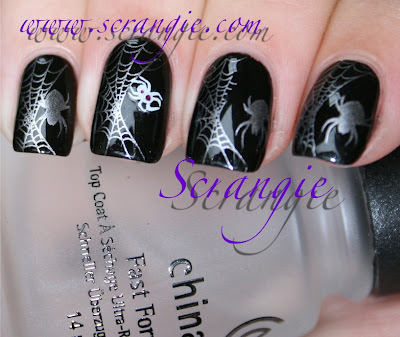 The ring finger has one of those Cina Haunted Nights decals (the little spider with a red and orange gem accent). The old Sally Hansen was perfect for the stamp and the Cina decal applied easily and looks rather good with a coat of topcoat over it. Unfortunately, I can't say the same for the NYC Blackula polish. It's horrible. I've used NYC Black before and thought it was awful and the Blackula version is just as bad. It's runny, watery, streaky and has a really annoying flat brush. All it wanted to do is run off my nail and pool in my cuticles, plus it chipped off my thumb in a huge chunk the very next day. I haven't had that much trouble applying a polish in a loooooong time. With all the good, cheap, one-coat black polishes out there, I don't know how NYC's can be this terrible. True, I only bought it for the name and had no expectations of quality, but come on... At least give me a good brush to work with. I do not recommend the NYC Black/Blackula polish, but the plain old Wet n Wild Black Creme (99 cents!) is amazing if you're looking to add a good, solid, easy to apply, fast drying, one-coat black polish to your collection. It's my favorite. That and Illamasqua Boosh, but there's a pretty big price difference there. I like both. 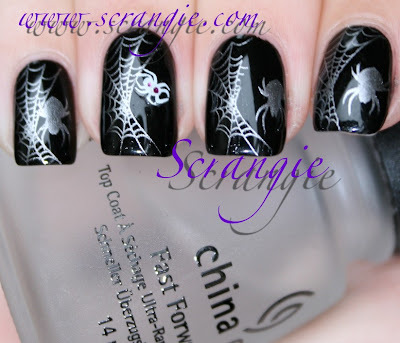 I like the spiders, makes it look a little less empty, but the spiderwebs alone look just as cool. I should do the stamp sideways as french tips... bet that would look interesting. 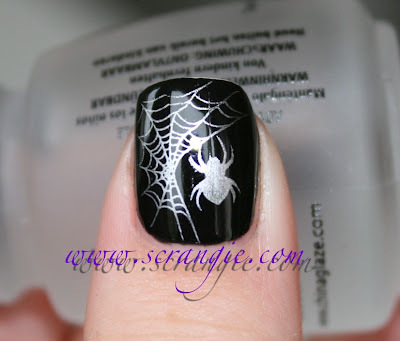 Such a great idea to try the spiderweb as french tips! The spiderwebs are really, really cool! :D Love it, because it's just black and silver, without oranges or reds or greens (the usual Halloween colours). you're so patient +_+ they seems to take a long time to do.. I havent used any of nyc's nail polishes..are they all horrible or just black? thank you. Cotton Candy, haha :D To tell you the truth, I haven't used NYC nail polish in years. Only the older ones, and even then I used them rarely. I haven't tried any of the new redesigned line besides the black, though I did buy the Halloween orange (Pumpkin), I just haven't tried it yet. Sorry! It's funny, I was planning to do this exact same design for halloween, great minds think alike eh? ;) Looks great! So simple yet so pretty! 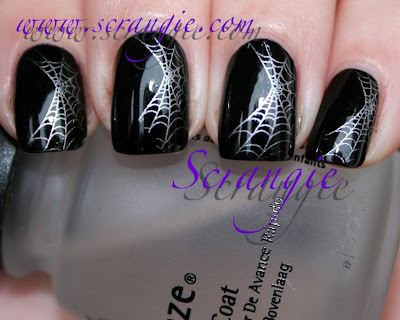 This is definitely a look I could work with (I'm not really into Halloween nails... Please don't hate me ;) ). Very pretty! Have I mentioned I LOVE the shape of your nails? That's so funny, I just did spiders and webbing with those same plates on my nails last night!!! I just did a similar mani using the same stamp!! Different colors! Wow-that's cool to me-your blog is like the bible of polish! Wow, that's great, I love it! I just got the NYC polish yesterday. Crap! Love the manicure. Very Halloween! I love these stamps. In fact, I have a mani I'll be posting in the next few days using the same stamps in a different color schemes. Mins, it may be the polish you're using for the stamp! Are you using Konad Silver? That one's known to cause problems. It could be a faulty plate, but it could also be that your stamper or plate have residue on them- have you tried cleaning them with pure acetone and then trying again? I don't have Konad silver polish, I've always been using China Glaze Millennium for stamping and never once had problems besides this time ): i also tried cleaning the plate very thoroughly already but it didn't work ): Do you think Bundlemonster will do exchanges for a certain faulty plate?